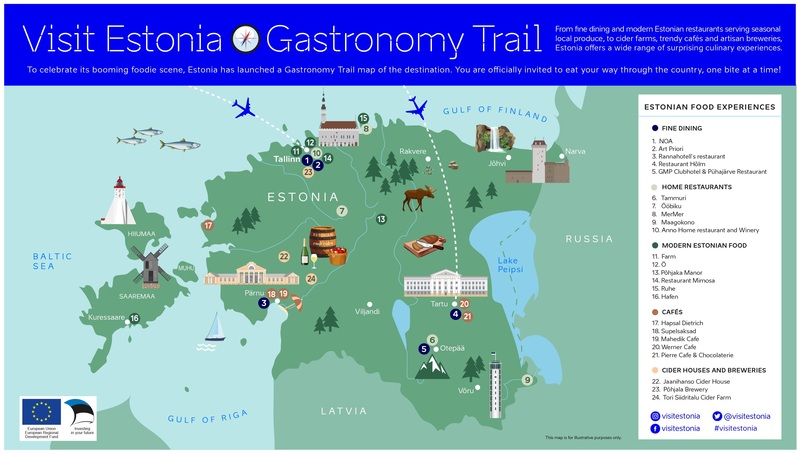 Have a look at the Gastronomy Trail map to discover some of the best restaurants, cafés, craft cider houses and local breweries available throughout Estonia. The handy map highlights the key places that provide the best foodie experiences across five key categories - fine dining, home restaurants, modern Estonian food, cafés, cider houses and breweries – and enabling guests to design their own gastronomy trail. Visitors are officially invited to eat their way through the country. Estonia is home to a selection of top-rated fine dining restaurants which perfectly balance Estonian gastronomy traditions with modern flare. Sitting on the shore of the scenic lake Pühajärv in southern Estonia, the legendary GMP Pühajärve Club House & Restauranthas featured multiple times within the prestigious ‘White Guide Nordic’, a list of the best Nordic restaurants. Hailed as the best restaurant in Tartu, Restaurant Hõlm offers a world-class menu and the opportunity for guests to enjoy chef Lauri Ülenurm’s culinary magic from his open-view kitchen. At NOA, chef Orm Oja’s experimentation with raw ingredients has earned NOA a place within ‘The World's 50 Best Restaurants’ list, whilst Art Prioriis known for its wonderful and original mix of food and art. Estonians are renowned foodies and often turn their own kitchens into one-of-a-kind, cosy restaurants. It is the case with Anna and Erno, the owners of Anno Home Restaurant & Winery, who offer a menu made from fresh, local ingredients. MerMer, situated in the historic fishing village of Kolga-Aabla in the Juminda peninsula, serves delicious, unpretentious organic dishes. Farm-based home restaurants are also on the rise, with Ööbiku Farm offering a constantly evolving menu prepared with seasonal forest products, and Tammuri Farm Restaurantserving a no-fixed menu based on fresh and home-grown ingredients. There is a new generation of Estonian chefs leading a culinary revolution by mixing Scandinavian-inspired cooking with traditional flavours to conceive innovative dishes at reasonable prices. Estonian chefs are heading to the forest for inspiration – whether it is wild mushrooms, spruce shoots, pickled ramsons, blackcurrant leaves or grated green pine cones. Modern Estonia food is perfectly embodied at Põhjaka Manor in the green region of Järva County, where delicious food is prepared using nothing but local raw produce. Nordic-infused cuisine is beautifully mastered at Restaurant Ö, led by chefs Ranno Paukson and Martin Meikas, who draw inspiration from their home island of Saaremaa - the largest island in Estonia - to create complex, refined dishes mixing land and sea. Estonia is famous for its countless cosy cafés located in stunning historical locations, where visitors can enjoy the local buzz and taste fantastic traditional food. Every café in Estonia has its own unique story to tell. Tallinn’s gothic Old Town charms with its romantic cafés specialising in artisan chocolate and marzipan, while visitors can relive the golden 1930s by visiting Café Dietrich in Haapsalu, a beautiful seaside resort town located on the west coast. Mahedik Café has been the first place in Pärnu to champion organic food and, over the past 120 years, Tartu’s Werner Café has hosted famous musicians, artists, actors and writers, earning TripAdvisor’s number 1 spot for the best café in Tartu. Estonia has a long-lasting tradition of craft beer and cider. Born in 2011, Põhjala brewery has quickly become one of the most important independent breweries in Estonia. The Speakeasy by Põhjala bar in Tallinn’s artistic Kalamaja district offers visitors the opportunity to try its ward-winning craft beers. At Tori Cider and Wine Farm apples and grapes are grown organically. The cider is made with a traditional champagne-inspired method, ‘méthode traditionnelle’, where the natural bubbles created during fermentation contribute to the cider’s fruity and fresh flavour. Pärnu’s Jaanihanso Cider House – a family-owned cider and orchard house located in an 18th century farm – produces some of the finest organic cider in the country. The Estonian craft beer scene is all about mixing traditional flavours with modern techniques to produce small batches of unique beer. Recently a TV channel from Norway called Matkanalen visited Tallinn, the capital of Estonia, and visited some great restaurants. The Estonian Cider House is the only cider house in the Baltic region and one of the few in Scandinavia and Europe. Come visit us!